Exploration of the sea was a trend that had begun in earnest with the landmark findings of the Challenger expedition. The scientific study of the ocean had become a legitimate endeavor and came to be known as oceanography. In the years since the ambitious charter and success of the Challenger, scientists continued to dredge and trawl through the midwater ranges to gather specimens for study and identification. Many scientists began to grow increasingly frustrated with the limitations of this kind of sampling, feeling certain they were missing a great deal more than their slow and blindly prodding nets could retrieve. One scientist working for the New York Zoological Society, who was amongst the frustrated scientific community, made the ingenious and risky leap from sampling blindly with nets to visiting and observing the deep. William Beebe pioneered the very first deep ocean, manned submersible that was capable of taking an observer down into the darkness and crushing depths of the deep. Just barely big enough inside for two men, the bathysphere (as it came it be called) was a spherical steel ball with inch-and-a-half-thick walls. It was fitted with a heavy steel door that had to be bolted on, and had a single, round window about 6 inches across and three inches thick, that observers could use to peer into the strange living world of the deep. 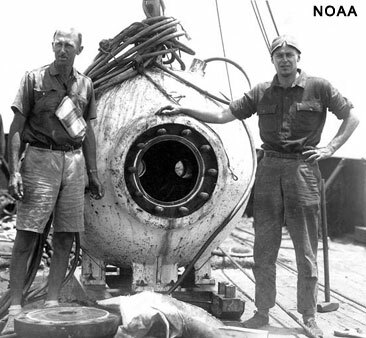 The bathysphere reached depths of over half a mile down by being lowered on a cable, making the trips down below especially dangerous. Having no maneuvering thrusters or steering controls made the bathysphere vulnerable to the pitching and rolling actions of the ship to which it was tethered. It took a strong stomach and incredible bravery for Beebe and his associate to make those early deep sea dives. But for the first time ever, human eyes were able to observe the organisms that inhabited the still and lightless world of the deep. Aided by a powerful floodlight fixed to the outside of the bathysphere, William Beebe saw incredible creatures alive and darting about in their own habitat. . He had no sophisticated cameras to be able to take photographs of what he saw during his dives, so he reported details of his observations to an artist who reconstructed some of the ghastly creatures he saw in illustrations. 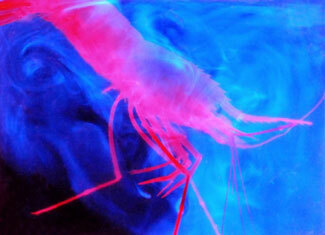 Glowing blue ink is disbursed by a deep sea shrimp fleeing from perceived danger. Just about everything living in the perpetual darkness of the deep sea glows in the dark! One of the most remarkable phenomena that he observed of life in the deep that is characteristic of most creatures living in the darkness of midwater were incredible displays of light produced from within the bodies of living organisms. Now known as bioluminescence, Beebe was astounded by the sheer numbers of creatures exhibiting this tendency to display their own light – in a world of perpetual darkness the language of survival was spoken in flashes of light. In the years that the bathysphere made its numerous dives off the coast of Florida Beebe and his team identified new species never before brought to the light of day. Not only did they conduct the most comprehensive examination of deep sea life in a concentrated area for that time, Beebe’s observations during his descents in the bathysphere contributed a completely new perspective to the study of life in the deep. Beebe’s first hand accounts and illustrations of the incredible diversity and even delicate nature of the life he observed in the deep reinforced the fact that the crude dredges and trawls were missing most of the real action. The best way to study life in the deep is to observe it in its own habitat.